Apple have created a head crab. 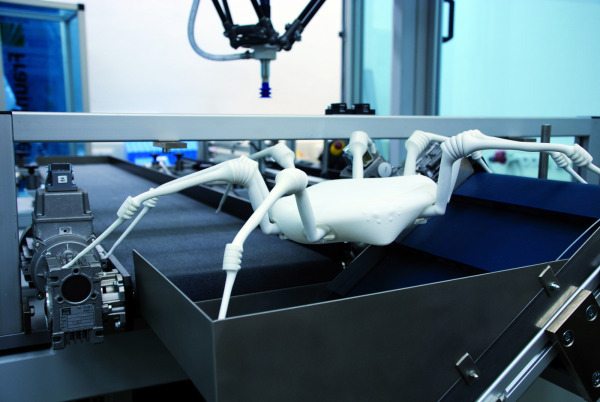 Researchers have developed a new form of first scout, replacing the keen-nosed rescue dog with a rather scary looking robot-spider. It was created by researchers at the Fraunhofer Institute of Manufacturing Engineering and Automation. Designed for use as a first response unit, this robo-arachnid is equipped with a camera and full sensory suite, to allow it to transmit live video as well as track down possible lethal chemicals or gas leak sources, as to dissipate a haz-mat crisis. The spider's walking style has even made the transition into robot technology: four feet planted, four feet advancing simultaneously. The limbs are powered by hydraulic bellows that build up high levels of body pressure, injecting pressurized fluid into the leg, causing it to extend. In some cases, these processes have been strong enough to cause some Spiderbots to actually jump. The number of steps to build one are reduced by 3D printing experts, reducing the weight and cost to produce. It's merely a prototype; but the researchers are optimistic that it'll soon be exploring dangerous areas soon, and scaring kids the world over. Editorial: 3D retrofitting. A Sinking Ship?